The WeatherTech DigitalFit FloorLiner accurately and completely line your vehicles interior carpet giving you "absolute interior protection". 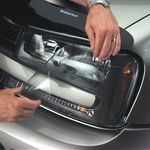 Digital laser measurements of interior surfaces offer a consistently perfect fit to your vehicle. Constructed of a High-Density Tri-Extruded (HDTE) material allows for a rigid core for strength while offering surface friction to the carpet, as well as tactile feel to the surface. Advanced surfacing creates channels that carry fluids and debris to a lower reservoir with further channeling to help minimize fluid movement while driving! 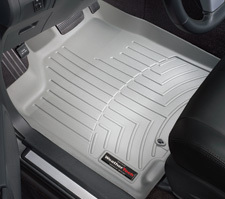 Once fluids become trapped in the reservoir, away from shoes and clothing, they are easily removed from the WeatherTech® FloorLiner™ over the door sill...no muss-no fuss! 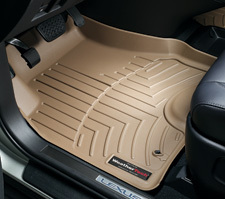 The Rear DigitalFit FloorLiners incorporate many of the same design features as the front FloorLiners, but the Rear DigitalFit FloorLiners are manufactured from a proprietary custom blended TPO (thermopolyolefin) that is not only wear resistant, but also remains flexible under temperature extremes. 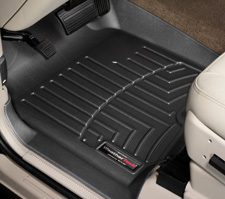 The Rear DigitalFit FloorLiners come as either a one piece or two piece depending on your vehicle application. We carry rear and front floor liners for most import and domestic trucks, SUV's and minivans. The floor liners are easy to install. Simply remove the original carpet floor mat prior to installation. Make sure you do not Do not place on top of any existing carpet, plastic, or rubber mat. Make sure to regularly clean your floorliner, it will extend the life of your FloorLiner™. When your ready to clean your floorliner first remove it and shake it to remove any liquid and loose debris. Then use only a mild detergent soap and water to clean it. make sure you do not use harsh chemicals or abrasive type cleaners as these products may damage your floorliner. NOTE: FloorLiners were designed for vehicles with factory carpet installed when manufactured. They will not fit vehicles with vinyl floors unless otherwise specified. to be shipped. All floorliners are custom made and are NOT returnable.